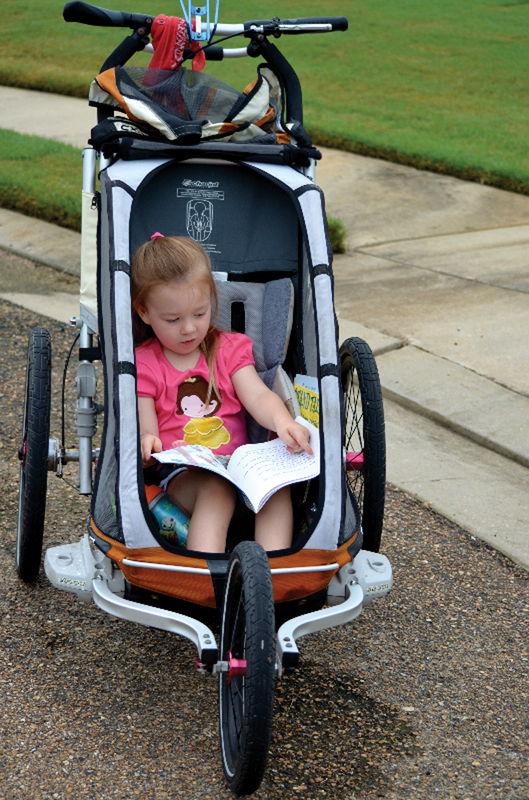 One dad’s tips to make sure you both get the most out of running with a stroller. The first gift my wife and I received after finding out we were going to be parents was a baby jogger. After hundreds of miles behind it, I’ve got some pretty good tips and tricks, not just for running, but for keeping your future marathoner happy as well. Selecting the right stroller is key. I chose a Chariot because it is completely screened in, has a roll-down sunshade and removable plastic covers, that will keep your child cozy no matter what the weather. The screens are great because you don’t have to stop and pick up toys, cups or food because the screens keep everything inside! Plus, the Chariot can be converted into a great bike trailer. If you’re not running longer than a half hour or so, in moderate weather, the Chariot would probably be overkill. A lot of people like the Bob, which is nice, but I’ve found another option. The Expedition is similar to the Bob (not quite as plush), but much less expensive. We bought one for travel and I also use it for racing, it’s lighter and easier to maneuver. My recommendation is that you start your baby in the jogger as soon as you can. We had Ginger in ours a couple of days after we brought her home from the hospital. No, we aren’t crazy, we only walked with her the first few weeks. But as soon as she was able to hold her head up really well, we were running. For babies, it’s pretty easy, pack a couple of extra bottles, diapers and wipes and you’re on your way. A small towel can be handy for diaper changing; you can lay the baby on it instead of the sidewalk. A lot of people run with both hands on the stroller. But I find it easier to hold the right side of the handlebars with my left hand and run out to the far side (and vice versa). This way I don’t have to change my stride too much and I don’t have to worry about kicking the stroller. Just remember to switch sides every so often so you don’t get out of balance. Bring a bunch of small toys and thin paperback books. Bring a variety of favorite foods. I put them in the pockets inside the stroller so Ginger can pick out what she wants, when she wants it. Sing. You can sing some of your child’s favorites along with her or turn it into a music history lesson to share some of your favorites. Teach. This is a great time to teach your child about nature, wildlife, shapes, colors, etc. I have her count the miles (up and down) with me, and get her to practice the alphabet. Stop. If Ginger is up for it, I gladly stop and let her run until her heart is content, which doesn’t take very long and then she’s ready to get back in and point out squirrels or read a book to me. 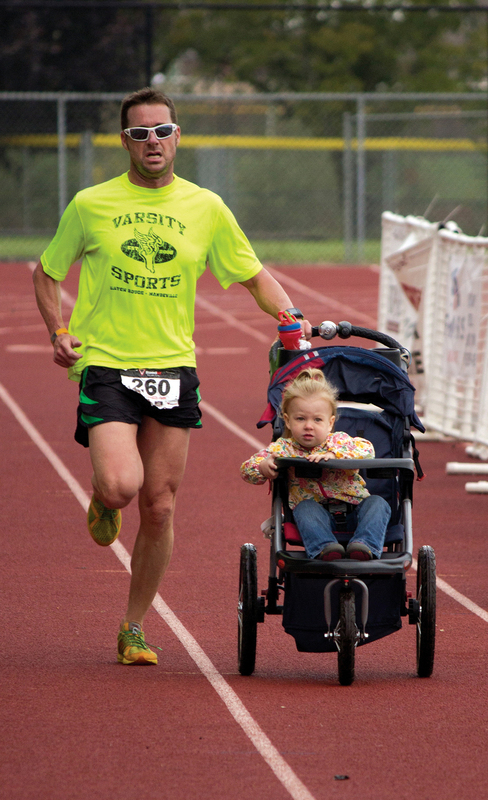 A good friend once told me that all pushing a stroller does is teach you how to run with one hand. I hate to disagree because he’s way smarter than me, but not in this case. A jogger can be a valuable training tool. Hill work is already a great workout, add in the stroller and you’ve got the makings of a serious strength day. I have a couple of courses that really work me. I also have one special hill that I’ll run up and down several times during a run. I try to turn it into a math lesson with Ginger and get her to count the number of times we have run up, and/or the number of times we have left to go. Try speed work while pushing the stroller. This works best on the road, pushing a stroller on a lot of turns or at the track is just a pain. But doing some speed sets will really help you get faster and you’ll feel like a Kenyan when you run without the stroller. One thing you should consider, don’t give your child your phone or your iPad at first. See how long they can make it without. I did this and now I’ve got an ace in the hole for my long runs. I really hope I’m not jinxing myself here, but I haven’t let Ginger have the iPad while we’re running, ever. I keep it hidden for an emergency. You know, when I’m miles from home and can’t get her to settle down? Hopefully I’ll never have to pull it out, but if I do, I’ve got it. And it’s not all about the physical benefits you can gain while pushing, or the fact that you don’t have to get a babysitter. I’ve spent hundreds of hours with my daughter, just the two of us. No TV, no phones, just the open road. We talk, we sing, we count, we laugh and we enjoy the quiet. As physically demanding as it is sometimes, I’m really going to miss it when she’ll no longer ride. I’ve talked to parents who have children that won’t cooperate for more than two or three miles. I know I’m lucky Ginger puts up with being in the stroller for hours instead of minutes. But one thing is for certain, when she realizes her friends spend weekend mornings in their pajamas, eating pancakes and watching cartoons and not out on the roads, I’m going to have a lot of explaining to do!